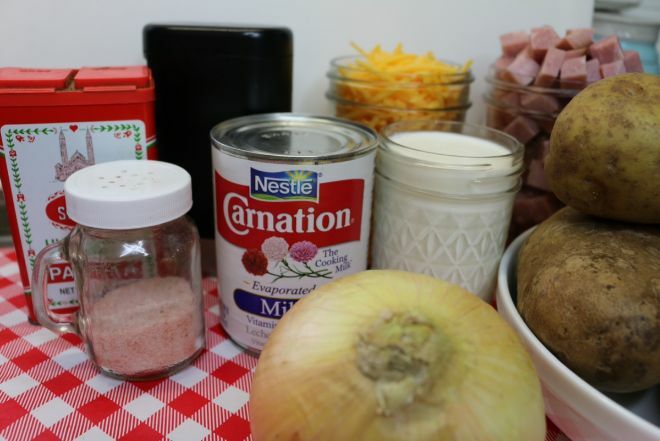 Watch the video above for the Southern scalloped potatoes with ham recipe. Nothing makes comfort food more comfortable or accessible than a slow cooker! This is the perfect vehicle for a myriad of comforting recipes that many of us remember from our childhood. This recipe is no exception. I did not grow up with this recipe, but I am a transplant to the south! Living in North Carolina for almost ten years can tend to do things to a person. 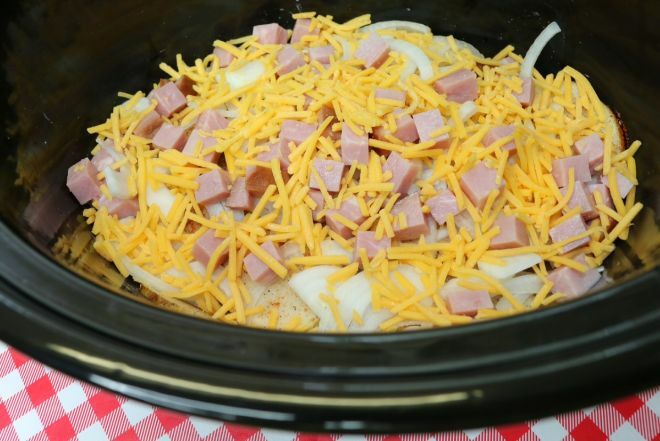 One of the dishes that we do enjoy is old fashioned Southern scalloped potatoes with ham. This recipe really lends itself to the slow cooker. It is easy to throw together, and when you come home at the end of the day all you really need to do is make a veggie or a salad for dinner to be ready! When I made this dish and my teenage girls returned home from school, they said the kitchen smelled like the church potluck on a Sunday afternoon. If you are not familiar, that was a compliment! Nowhere on earth will you find a more delicious collection of foods than you will at the church potluck, the first Sunday of every month after services. So let me help you create something delicious for dinner tonight. 1. 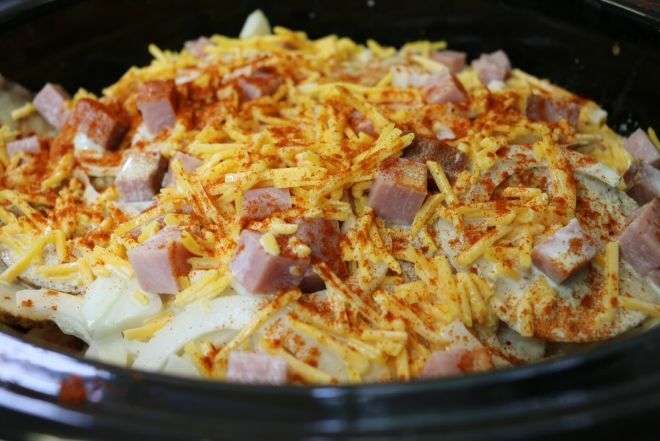 Layer 1/3 of the potatoes, onions, ham, and cheese in the bottom of the slow cooker. 2. Sprinkle salt, pepper and paprika on top. 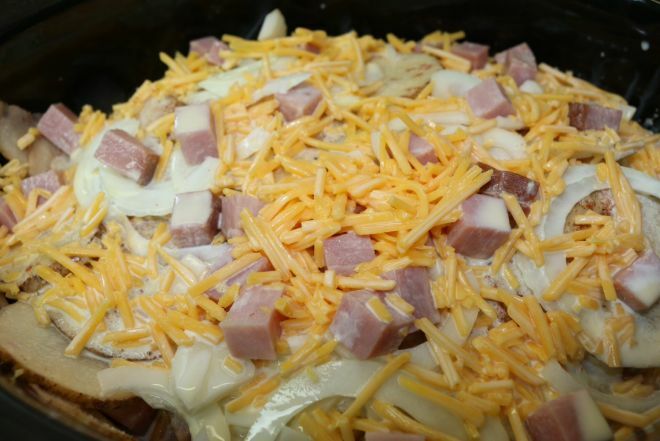 Then build two more layers the same way until you have used up all the potatoes, ham, onions, and cheese. 3. Add the milk and cream to the slow cooker. No need to mix together or stir. Just pour it over, and it will work its magic. If you prefer, you can use half and half or plain milk in place of the cream. 4. Sprinkle with more salt pepper and liberally with Paprika if desired for color. Place the lid on and set the slow cooker on low. Allow to cook for 4 to 6 hours. 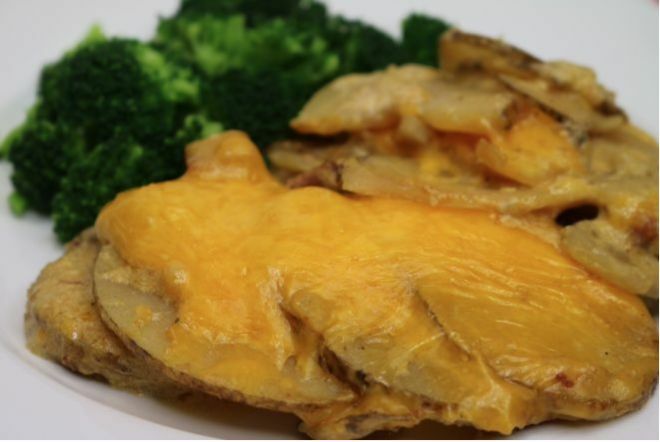 Resist the urge to cook this one on high because the cheese may burn and lend an acrid flavor to your dish. Low and slow is the name of the game here. 5. 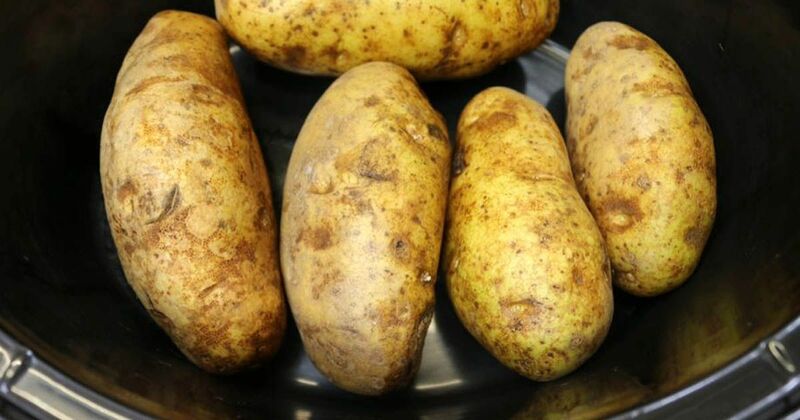 The dish is done when the potatoes are cooked through and are soft. You can add another cup of cheese over the top and allow it to melt before serving! Can you really have too much cheese? This is delicious by itself as a meal or as a side dish. Any leftovers can be saved in an airtight container in the fridge for up to a week. You can pop this in the freezer for up to three months. Thaw on the counter, and then place back in the slow cooker with a splash of milk or chicken stock. Set on low for a few hours. Sprinkle with a bit more cheese, and you have a great meal all over again that your freezer banked for a no-fuss dinner in the future!